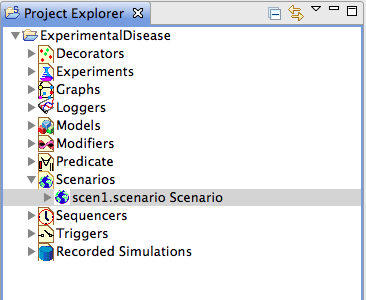 To create a new STEM project, click on the ‘new project’ icon in the command bar, or from the “New”-menu use the “New -&gt; scenario” command. 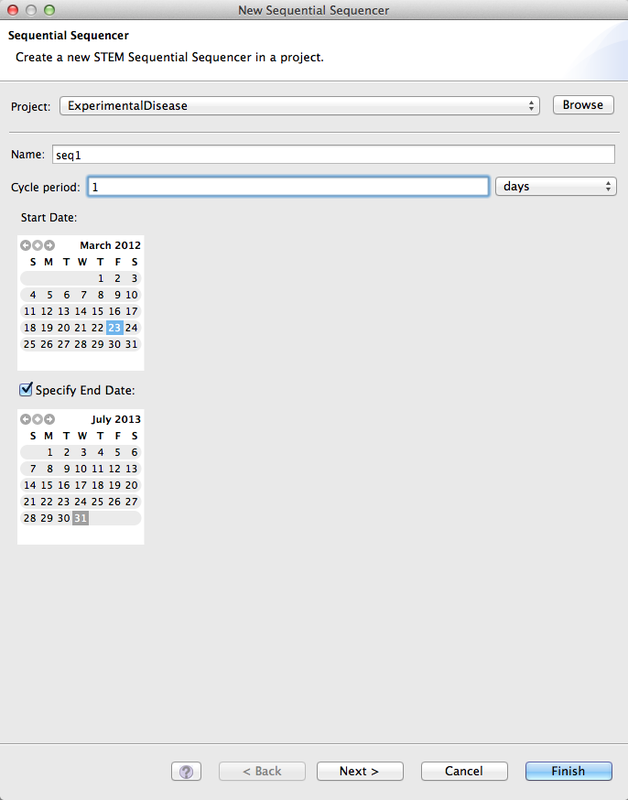 ''Figure 2: Project Explorer'' <br> The ‘Project’ structure thus created under the name ‘ExperimentalDisease’ contains headings for all the components that are necessary to compose a runnable scenario, including a substructure for the scenario definitions themselves. ''Figure 3: Scenario Creation'' <br> Upon creation of the scenario, you also select the Solver algorithm you want to use.<br> The Finite Difference method is a simple algorithm that is useful to quickly run a simulation and verify that everything looks right. However, for real scenarios where data is being collected for analysis, we recommend using the Runge Kutta Adaptive Step Size method because this algorithm is much more accurate. If you use the Runge Kutta method, you also need to specify a "Relative Tolerance" factor in the disease model parameters. The smaller this number the more accurate the calculations will be, but the simulation will also run slower. The default is 0.05 (or 5%), which we recommend lowering if possible to 0.01 or even 0.001. It all depends how much time you can spare running a scenario. There is also a third option DormandPrince853 that's using the Apache commons mathematical library (http://commons.apache.org/math/) numerical integrator. 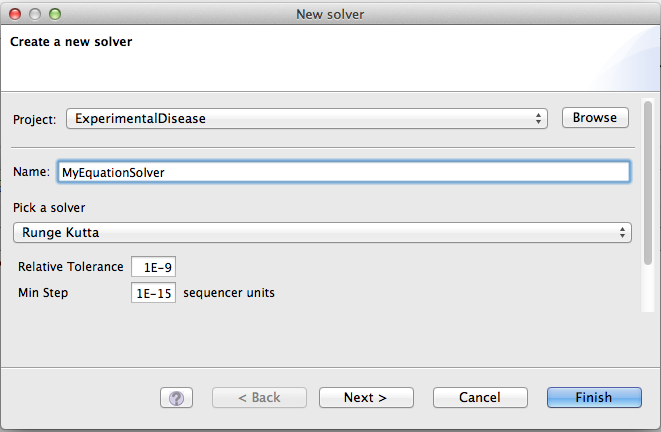 For more information on this solver and what the four parameters do see the documentation on the library web site (http://commons.apache.org/math/userguide/ode.html). A key concept in STEM is the idea of composing models on top of other models. A model in STEM is a container for graphs and a graph contains nodes, edges and labels. In STEM, a node is typically a geographic region (e.g. France), an edge a relationship between nodes (e.g. the fact that two regions share a common border). 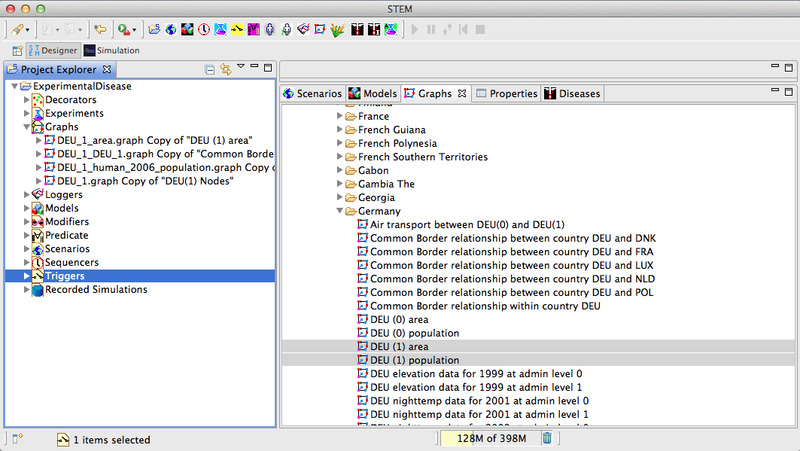 Labels store data, for instance the total population of a region or the length of a common border. 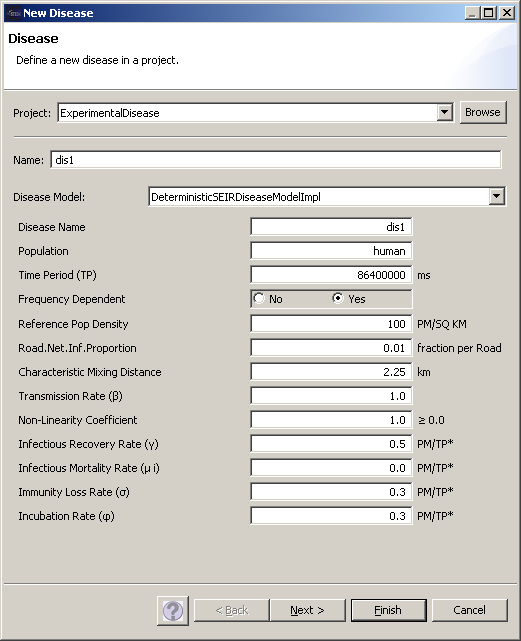 Models also contain decorators such as disease models or population models. 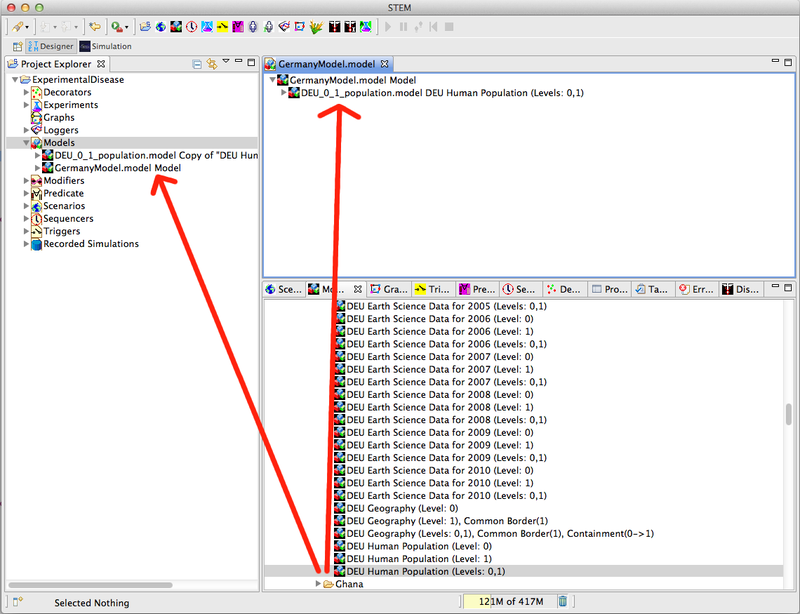 Decorators can create their own labels necessary to store data keeping track of the state of a population. 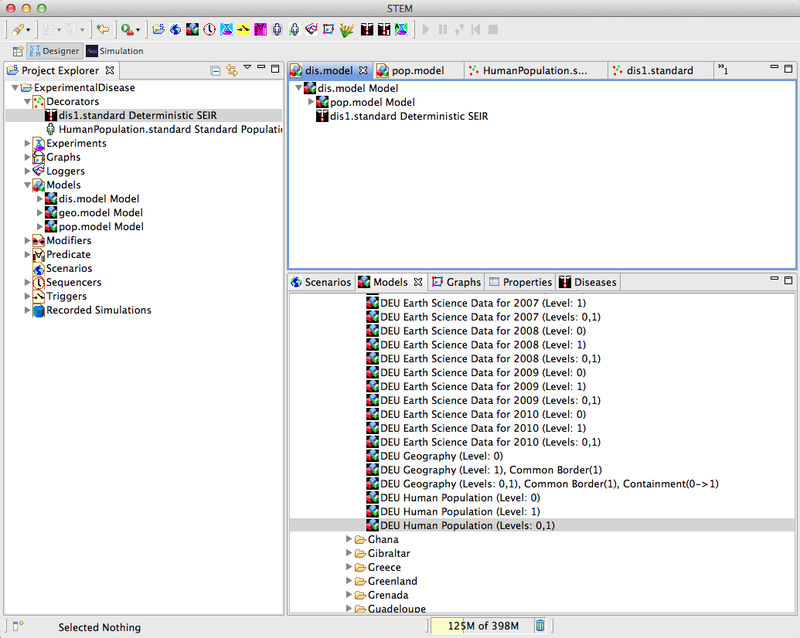 An SI compartmental disease model creates SI labels (on each node) to keep track of the number of susceptible versus infected people in each time step of a simulation. If you want to have more control over they graphs you want part of your scenario, you can use the Graphs view. 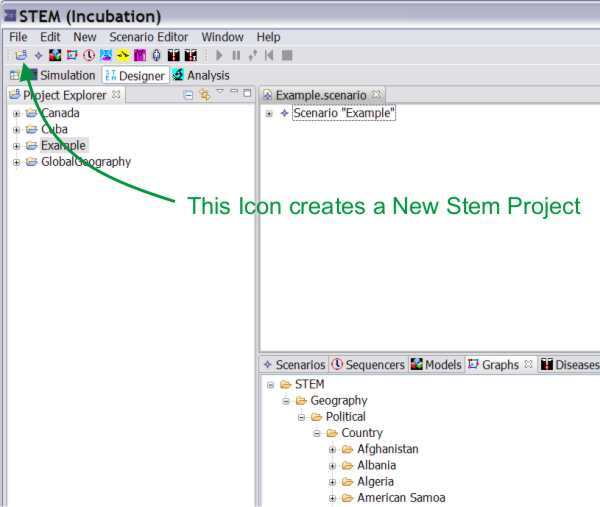 Specific geographical data and the population data can be imported as graphs from the STEM library by pulling the graphs from the STEM resources section on the right into the graphs section on the left under project explorer, or directly under an existing model in your project. Here we use country-specific data for Germany. In the model called 'pop', we will store the geography model plus a decorator of type standard population model that grows the population given a background birth rate and death rate. 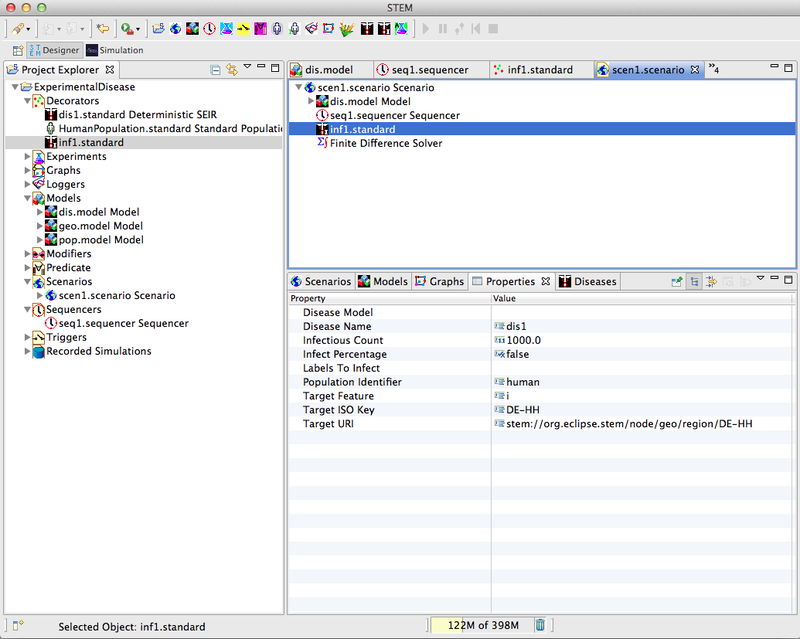 The standard population model is created by opening the "New Population Model" wizard in the toolbar. 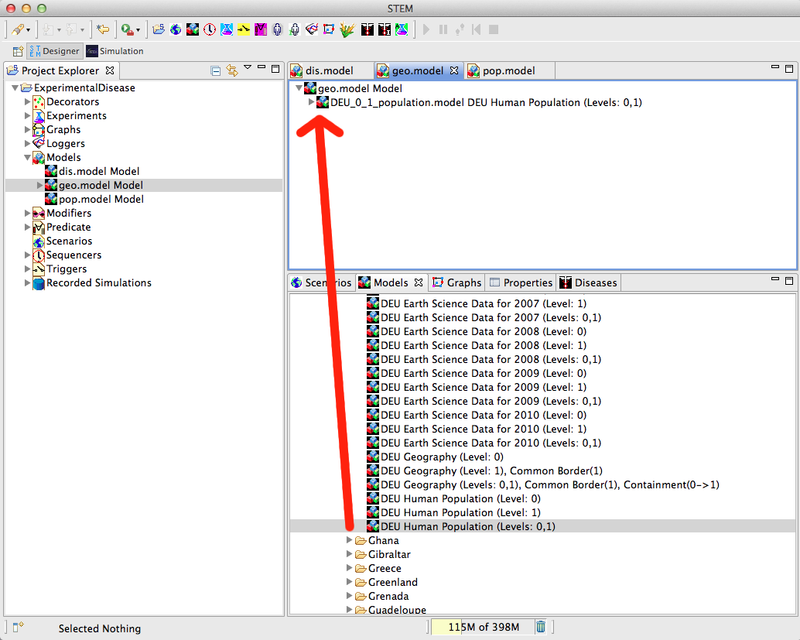 Select "Standard Population Model" in the drop-down and give it a name (e.g. HumanPopulation). 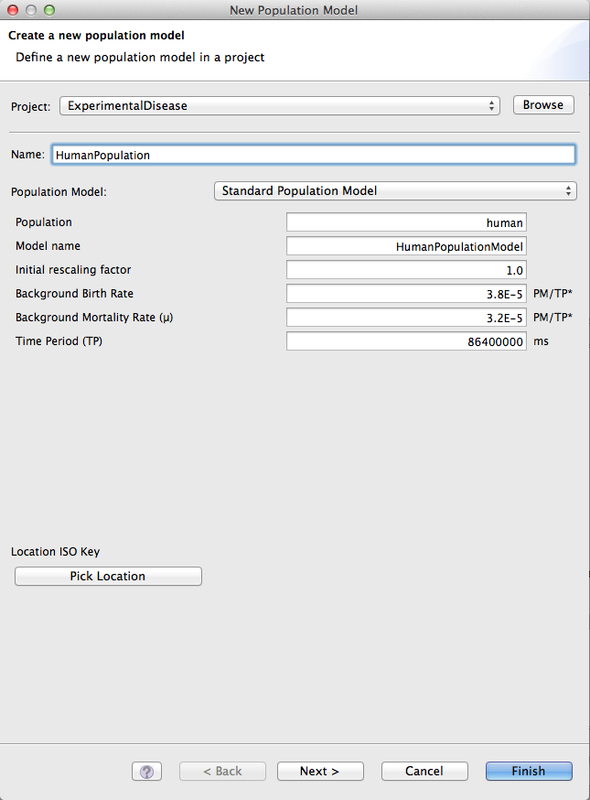 Specify the background birth rate and mortality rate of your population. 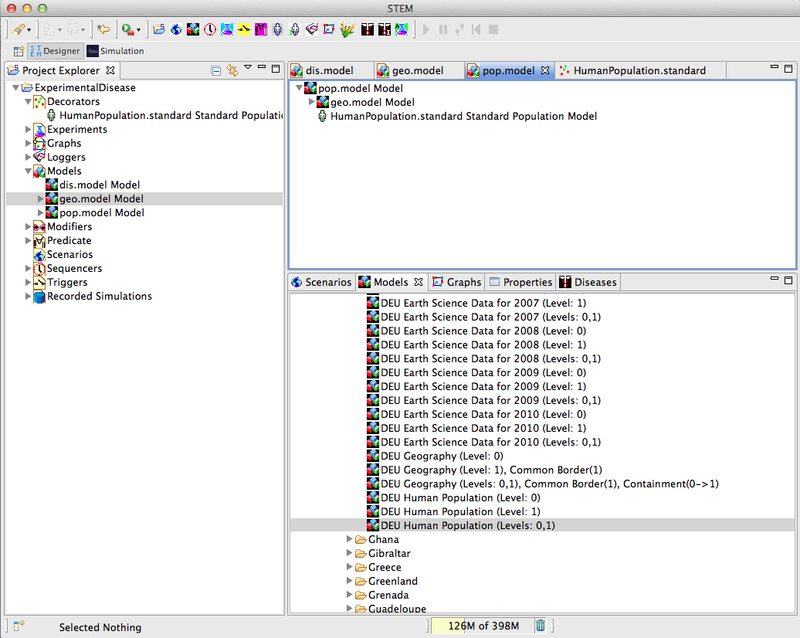 Now open the pop.model in the Designer Perspective, and dragging the new standard population model into it (from the Decorators folder). 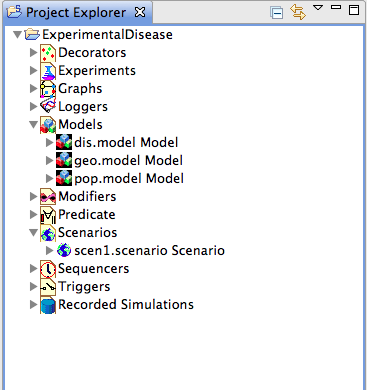 Also drag the geography model (geo.model) from the Models folder in the project explorer into the pop.model. Save (Ctrl+S) pop.model. 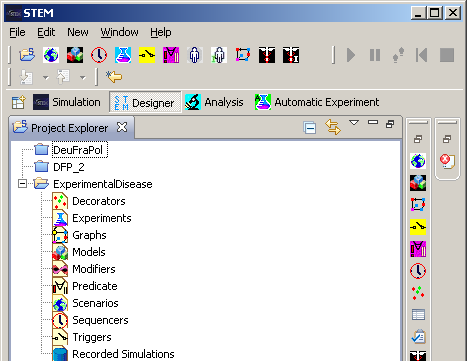 <br> [[Image:StemTut9.png]] <br> ''Figure 9: Disease Creation '' <br> <br> After creating a disease, you will be able to inspect the properties of the disease in the ‘Properties’ tab of the Resources section of the Designer View. Make sure that all parameters have been entered correctly, e.g., that you have a Transmission Rate larger than Zero. You can change the values of properties in this tab by simply editing them, and saving them by hitting &lt;ctrl-S&gt; in the Designer View again. The command “New -&gt; infector” allows you to create an infector. 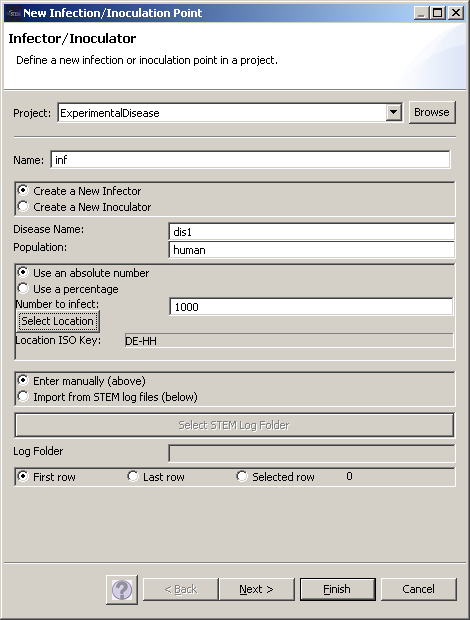 An essential information for the infector is the disease to be linked to this infector, thus ‘Disease Name’ must correctly spell out the name of the disease defined earlier. Furthermore, the geographical location must be specified (under the ‘Select Location’ button), in this case Hamburg as one of the 41 nodes in the geographic model for Germany.